Harvest Maiden is a new painting of mine celebrating the beauty and bounty of fall. Here in Atlanta, the days have been unseasonably warm and sunny unlike last year when the wind and rain quickly took the leaves away; this year we are witnessing the beauty of fall as the colors slowly unfold. In the late afternoon when I look out my studio window to the backyard wooded hillside, the vivid leaf colors against the blue sky with the sunlight streaming through are breathtaking. The view inspired me to do this painting. It feels good to be back to painting. I had been spending time matting and framing prints for the Flying Biscuit Cafe at their new location in John’s Creek. I also took a marketing class for artists which was helpful. I’ve never been business oriented but at this point it is an important skill I need to develop . The class was interesting, informative and fun; I realized that marketing takes creative thinking which is helping me to see it in a more positive light. I also have a new friend that I met at an art fair I was in who has tons of experience in corporate creative marketing. She is helping me get more directed and focused. Focus is something that has not come easy for me, I tend to get scattered in a lot of directions. My husband and daughter are both focused and directed. I can see it serves them well and they both inspire me so. I plan to both paint and keep up with marketing, it will take time but I’m trusting the process and feel it will pay off. I hope all are enjoying these fall days. 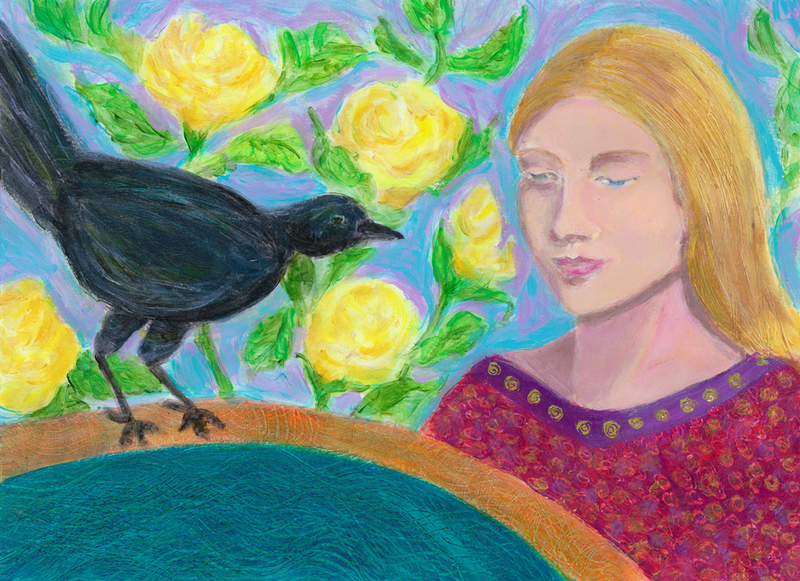 Crow Visits a Girl in the Garden is my most recent painting. After painting the Girl and Wolf, where the girl’s face was so small, I felt the urge to paint a larger portrait. The crows are back in our neck of the woods so they’ve been on my mind. I thought it would be interesting to place a crow with the girl in a garden scene. I’m fairly pleased, it was a fun challenge. It is quite chilly this morning and the leaves are just starting to turn, feels like fall now. The sky is bright and it will be warming up shortly, It’s great to have such a beautiful weekend after the past few dreary, rainy ones. I plan to go visit a local art festival this afternoon. Hope everyone enjoys their weekend! Autumn Buddha is my most recent painting. A friend lent me her Buddha statue that she inherited from her mother-in-law, along with the her prayer beads which drape his shoulders. I like the soft and peaceful look of this Buddha statue. This is the second painting I’ve made of the statue. Here in Georgia the fall colors are just getting started but I have been seeing many gorgeous images of fall scenes from Aquamosh’s Blog, a photography blogger that I follow. The rich warm colors of the fall images are just breathtaking. 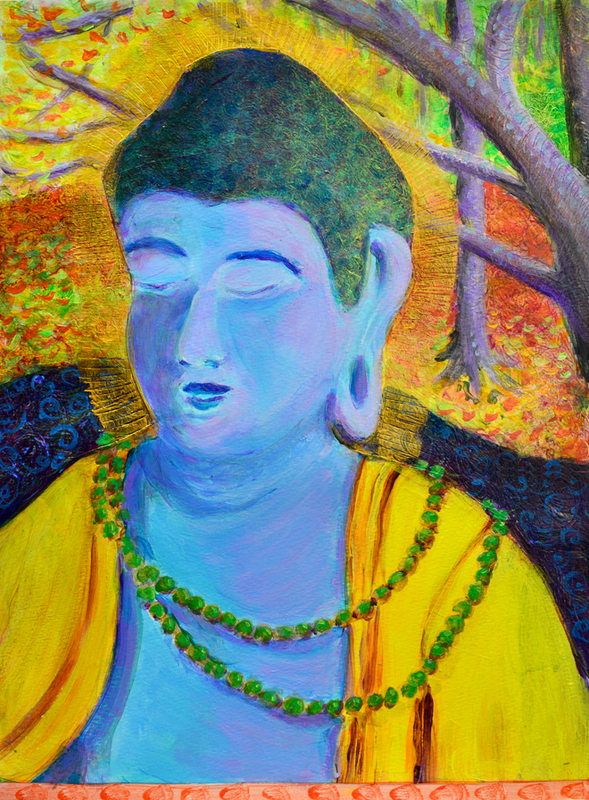 In this new painting I decided to play with those rich colors for the Buddha’s background. I’ve done several Buddha paintings most of which I used a carved wooden Buddha statue from Thailand as the model. We bought the statue because it reminded us of our Southeast Asia travels. We visited many ancient temple ruins in park like settings. I loved walking among the massive stone Buddhas sitting peacefully in the landscape. I’ve tried to portray the serenity I felt there in my Buddha paintings. Prints of all my Buddhas are available in my Circles Round the Sun Etsy Shop.